With the continuous support of our deft crew of personnel, we are fulfilling the assorted necessities of our patrons by presenting optimal quality Laminate Tubes. The presented product is made to suit the requirement of numerous packing applications. Before the final delivery, the product is examined on rigorous quality restrictions by our quality supervisors. Furthermore, we offer this product in a number of sizes and designs as per the information laid down by our patrons. Options: Auto Sealed nozzles. Open nozzles, upto 9 color printing, Full size Stand – up Caps. We look forward to be associated with you to serve the Health care as well as the Packaging Industry together in years to come. The multilayer laminate tubes (lami tube) made from laminates with aluminum foil barrier combine the excellent barrier advantages of traditional metal tubes & the attractive visual and tactile feel of the plastic tubes. These laminated tubes are made from the laminates, the structure of the laminate is described on the left image. The ABL laminated tubes give good collapsible effect (shown in the picture below) which is desirable where precise dispensing of the product is required. Today, ABL laminate tubes are not only used for toothpaste applications, but also increasingly for cosmetics, food, pharmaceutical and household and industrial applications. Versatile: The lami tube or laminated tubes can be used for a variety of applications like packaging of toothpastes, pharmaceutical ointments, cosmetic creams, food preparations, industrial and household products, and so on. In-process moulding and fusing of shoulder with laminate tube body: This is possible due to compression moulding technology which we offer and it is aesthetically more appealing, besides virtually eliminating the chance of shoulder/laminate leakage. 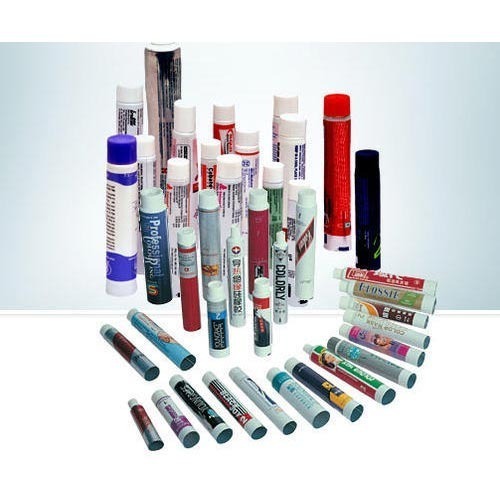 Printing Benefits: The lami tubes or also called laminated tubes can be printed up to 6 colors as per the customer's design. Excellent Flavour Retention: The lami tube or laminated tube body and the shoulder provides excellent barrier properties against permeation of gases like oxygen,and also the flavour of the product is retained inside the pack for the shelf life of the product. Also, the packaged product does not attract strong odour from outside environment. High Flexibility without Flex crack. Founded in the year 1981, Deep Packaging Pvt. Ltd. is a noticeable name immersed in manufacturing and supplying a superlative gamut of Aluminum Collapsible Tubes and Laminate Tubes. The product provided by us are specifically made up and designed with the usage of finest quality raw material and avant-garde machines in tune with industry quality norms under the stern supervision of our trained personnel. Our presented products are extensively respected in the market for their qualitative characteristics such as light weight, high durability, leak proof, sturdiness, fine finish and rust resistance. Together with this, we offer these products in huge sizes and can also be modified as per the exact demands of the patrons at inexpensive prices within the assured span of time.